We have worked with several government organisations for over 18 months to design, deploy and support WordPress-based intranets, which we have subsequently developed as an open source platform – GovIntranet. Current GovIntranet users include DCMS, the Northern Ireland Office and the Department for Business, Innovation and Skills. 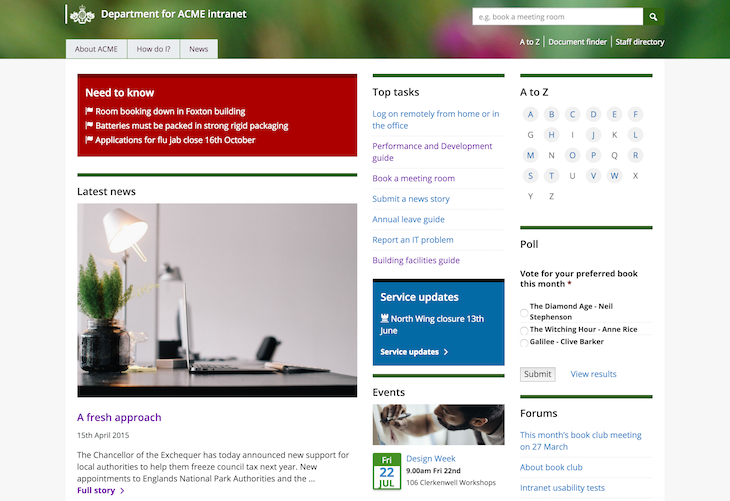 It draws inspiration from the simplicity and user focus of GOV.UK, and is designed to enable staff to do their jobs quickly, turning the intranet from a dull start page to a useful tool and a fruitful place to discuss work and social issues with colleagues. Govintranet adopts a simple, task-based approach similar to GOV.UK, giving clear and concise instructions with more detailed guidance where required. We have released the theme as open source and provide informal support to some small organisations and individuals implementing their own intranets using the software. As part of work for other clients, we continue to invest time in updating the intranet theme, making slight changes to styles and responsive design so it works on a range of devices. Supported Govintranet clients benefit from these updates at no extra cost.